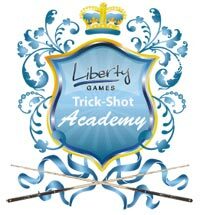 At Liberty Games we want to help each and every one of our customers to get the most out of their games room equipment, which is why we've teamed up with our good friend and snooker legend John Virgo to reveal a few of his trick shot secrets. Courtesy of Liberty Games, this is this week's trick-shot. Now what we've done is we've got the ball tray, we've put the pool balls in it, and the only ball we haven't put in it is the 8-ball, and we've put that over the middle pocket. Here's a way now for a bit of fun, put the ball-tray half way on the ball line, and we're going to send the cue ball round the three cushions,, it's going to hit the ball tray, rebound off that and knock the 8-ball in the middle. That'll impress some people won't it ? [cheering] Thank you, thank you!